I love appetizers! Whenever my family gets together we all bring different kinds of apps (and wine) and put them out on the counter while we catch up. Everyone migrates to the kitchen no matter how hard my mom tries to stop it! 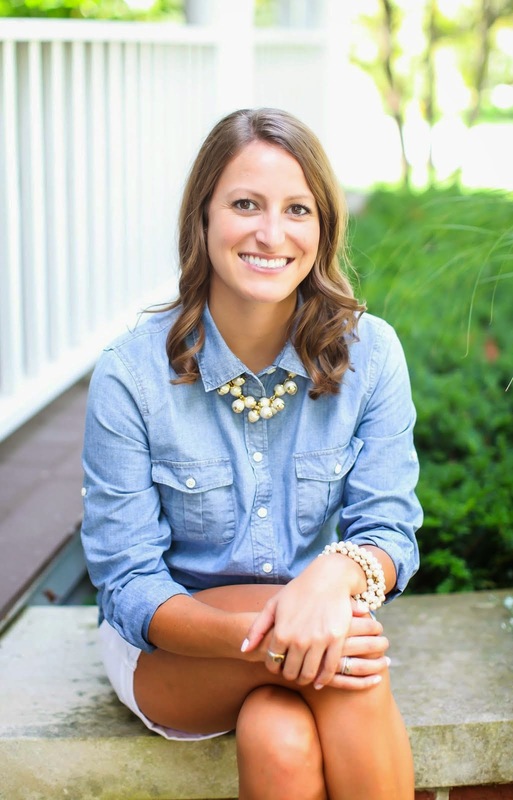 It's so fun to try new recipes and who better to test them out on than family?! 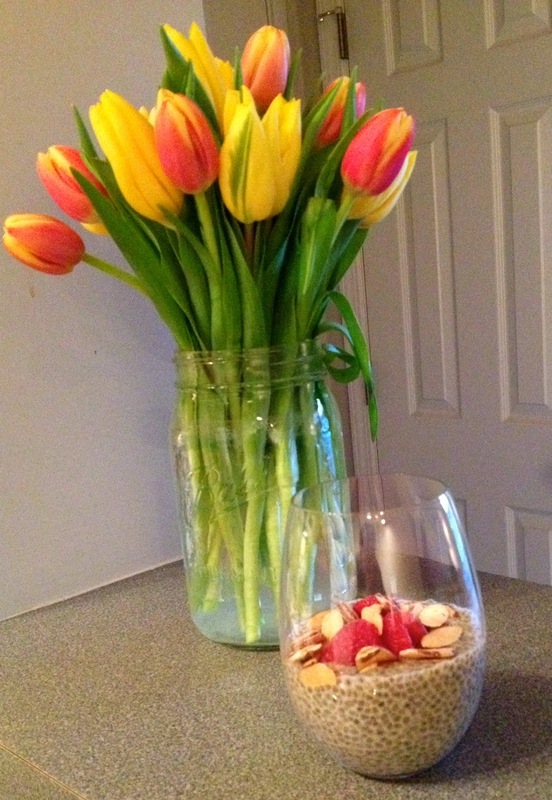 Knowing we were getting together to watch some March Madness games I needed to come up with something exciting...wanting it to be pretty healthy and light while being dairy free. 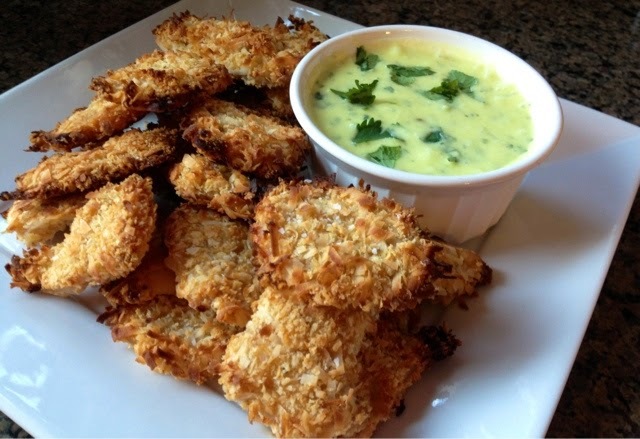 This weekend I was definitely feeling tropical (from our 35 degree sunny weather) and decided on coconut breaded chicken bites. I've been wanting to make something like this and thought I'd use a whole chicken breast but since I needed an appetizer I modified this idea to be bite-size. 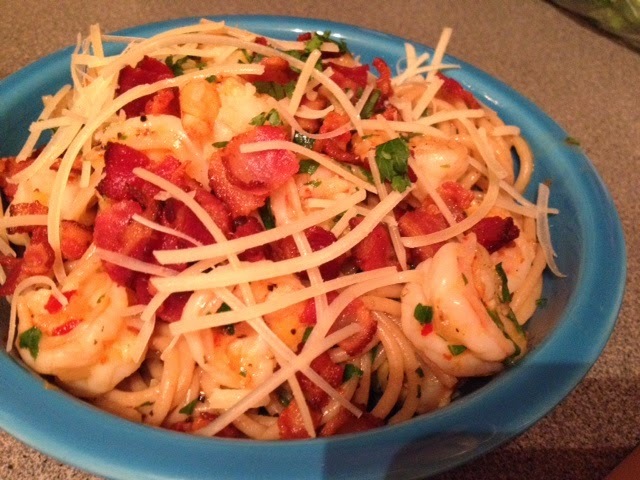 I will absolutely make this again as an entree and report back. I prepped this ahead of time and marinated the chicken overnight to ensure it was going to be flavorful and juicy. Let's start with the marinade. I started with 1 can of unsweetened coconut milk. It was so creamy! To that I added 2 minced garlic cloves, the zest of 1 lime, 1 Tbl Sriracha, 2 Tbl Soy sauce (I like low sodium), salt, pepper, red pepper flakes, and minced fresh ginger (a 1 inch piece is plenty). 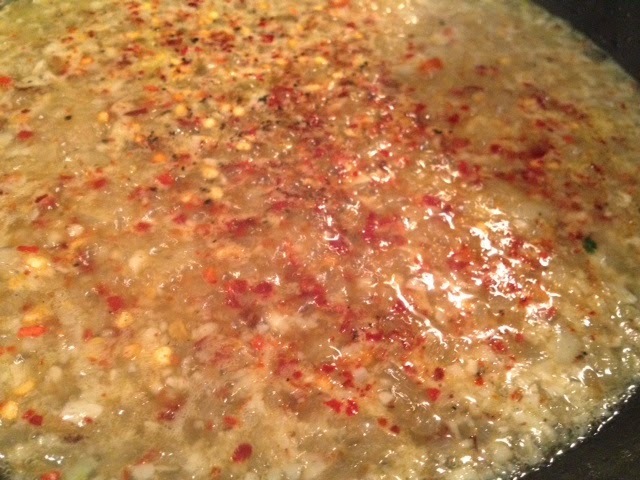 Give it a good stir and taste it- if you want it spicier, give it an extra drizzle of Sriracha. Feel free to add more or less of anything depending on your taste. 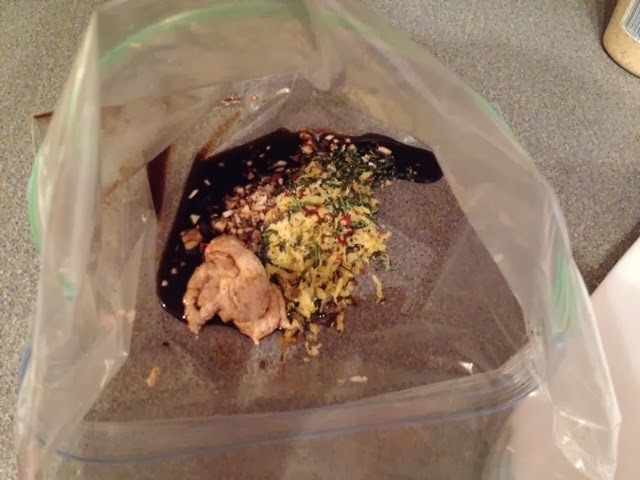 I then poured this marinade in a large ziplock bag while I prepped my chicken. 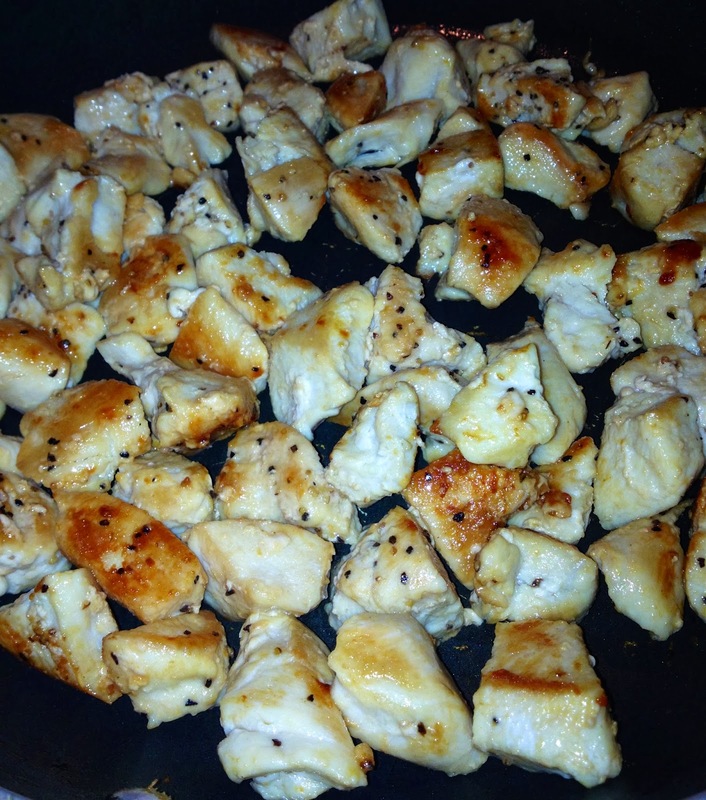 I used 3 chicken breasts and cut them into thin strips then halved those strips across for bites. You could cut in half lengthwise for little strips. It looks small now, but remember, after you bread them they become much larger! Add the chicken to the marinade and give it a good massage to make sure all of the chicken is coated in that wonderful marinade. Place in fridge and forget about it until tomorrow. You'll want to get yourself situated for breading, in order, with your sheet pan (lined with parchment or foil) at the end of your assembly line. It makes the process quicker and more efficient. On the far right I have my marinated chicken, which I didn't show but just pretend it's there! Then I have my flour seasoned with cayenne, salt, and pepper. You can season it with anything you like but make sure you at least have some s&p. We then move over to our eggs. 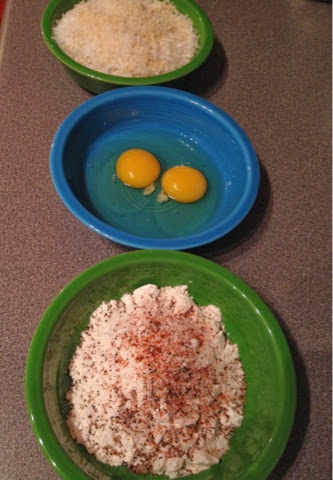 I have 2 whole eggs but you could use egg whites to be "healthier". The last bowl is equal parts Panko breadcrumbs and shredded sweetened coconut. Now mix the flour mixture, beat the eggs, and stir the panko and coconut mixture. Ready to get messy?! 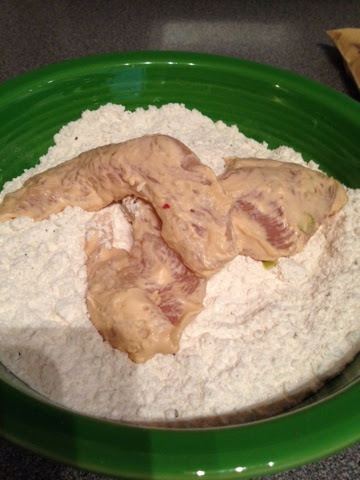 Plop a few pieces of chicken (shaking off excess marinade) into the seasoned flour. 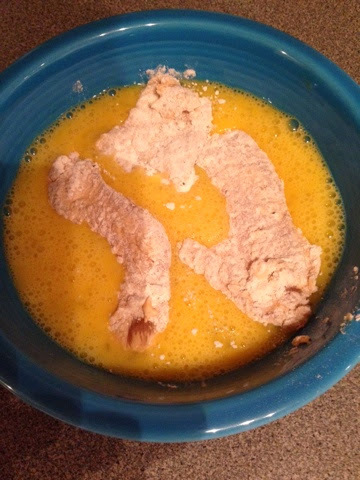 Using tongs or your hands toss chicken into the flour until completely coated. Shake off excess flour and drop into the egg mixture. Flip around to coat. Shake off excess egg. 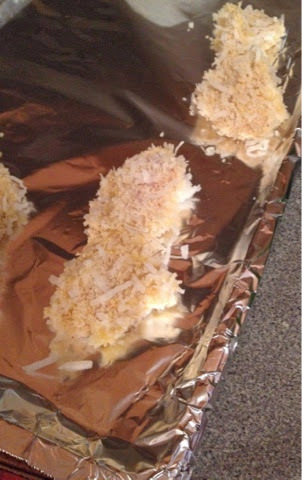 Drop into Panko and coconut mixture and flip several times, really pressing that breading into the chicken! 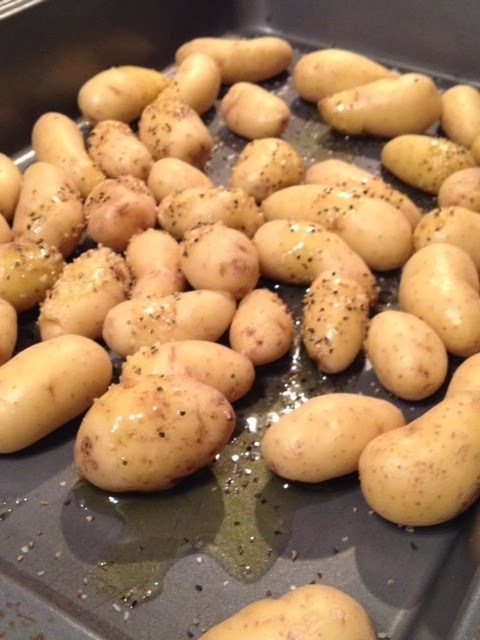 Take them out and lay gently on a lined baking sheet. Continue the breading process until you are out of chicken. It's possible you may need to refill your breading supplies halfway through...this is okay! You can bake these off right away or wrap tightly with plastic wrap and store in the fridge until your ready to cook them. I baked these at 375 degrees for about 20-25 min flipping over halfway through. When they come out of the oven I hit them with a little kosher salt. Eat as is OR with my spicy pineapple sauce! Easy as pie. I make this sauce in my Magic Bullet as I don't have a blender or food processor, but use whatever you have! I used 1 C fresh cut pineapple, half of a jalapeño, the juice of 1 lime, a tiny sprinkle of salt, 1 Tbl of sugar, some chopped cilantro, and 1/2 C of unsweetened coconut milk. Pulse it several times until well combined. It's a little thick but not exactly creamy. You could add more coconut milk if you want it super rich! I just love pineapple. Eating it takes me to a place where I'm laying beachside in warm weather drinking a fresh piña colada...what a lovely thought! Reality hits back in at some point but it's still nice to think about! 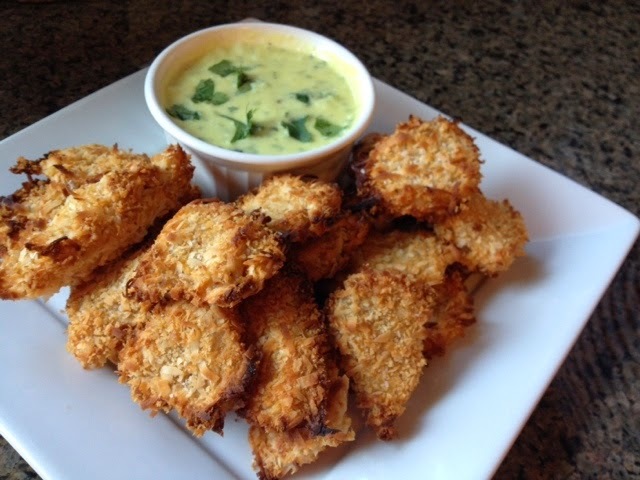 These chicken bites are seriously amazing! Crispy, sweet, salty, spicy, warm, and addictive. I hope you like!! After a long day of developing pizza I had gone into such a carb coma that I figured it'd be appropriate to continue the theme. 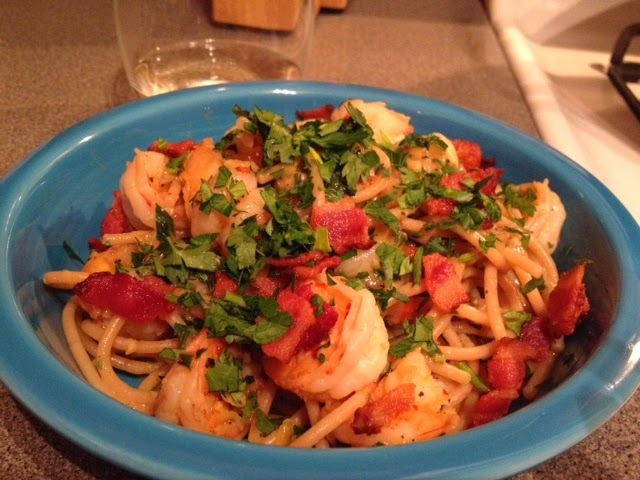 I had bought shrimp this weekend and figured shrimp scampi would be the way to go. And it certainly was! I love pasta...and I believe that if you eat a healthier version, i.e., whole wheat, somehow it cancels out the unhealthy carbs (let me believe this for a little longer). I wanted to put a spin on this pasta, by making it super spicy and also making it dairy free; butter lovers stay with me. Of course, you can add Parmesan cheese to yours with the addition of gobs of butter, but if you are like me and can't handle dairy too well, it's absolutely delicious without. This dish is super simple and it's pretty quick to put together. 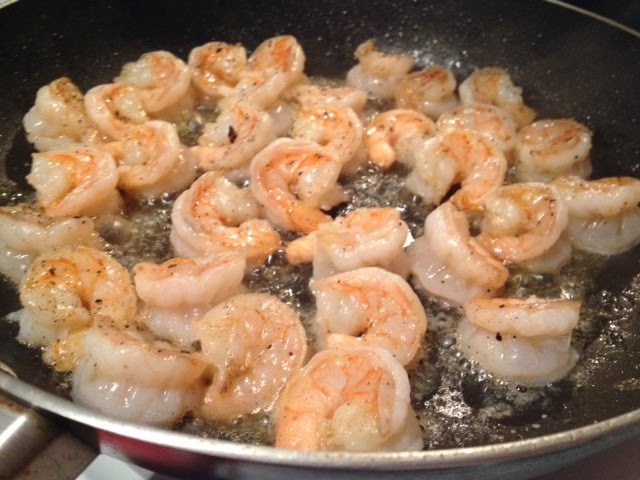 Shrimp cooks very quickly and for someone that personally went years of avoiding it because of that gnarly over-cooked texture, please read this recipe carefully! 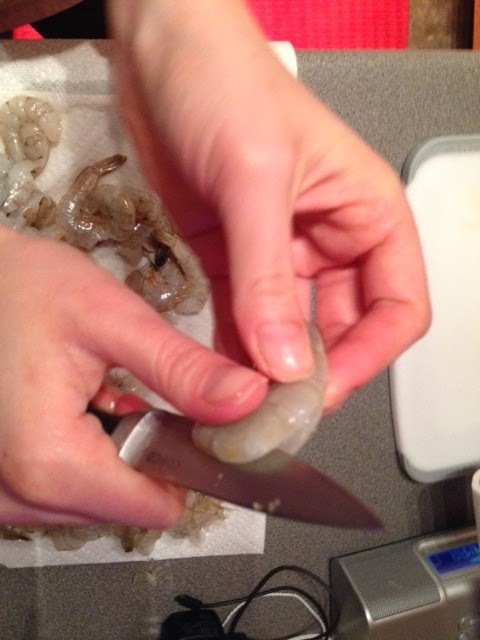 Also, I peeled and deveined the shrimp (you can buy it this way) and I also removed the tail. Here's the deal-I love the upscale appearance of having the tail on but I also find it awkward to eat it while trying to remove the tail with each bite...so I take it off. No judgements. 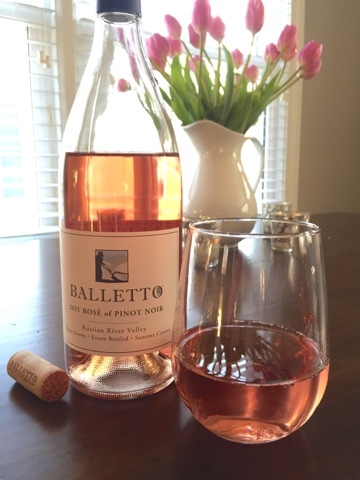 In this recipe you need a little white wine, feel more than free to enjoy a glass or two while cooking. And play a little Mariah, I always do! Here's what I did. 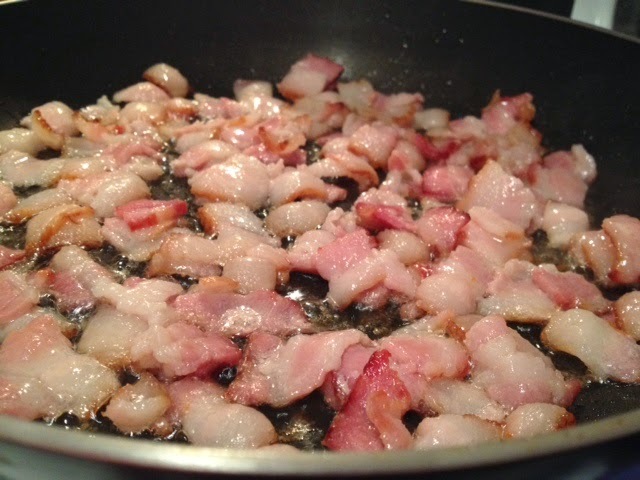 Start by dicing about 8 strips of bacon, and putting into a cold frying pan. Bring up to medium and sauté until golden. Flip over and cook on the other side until super crispy. 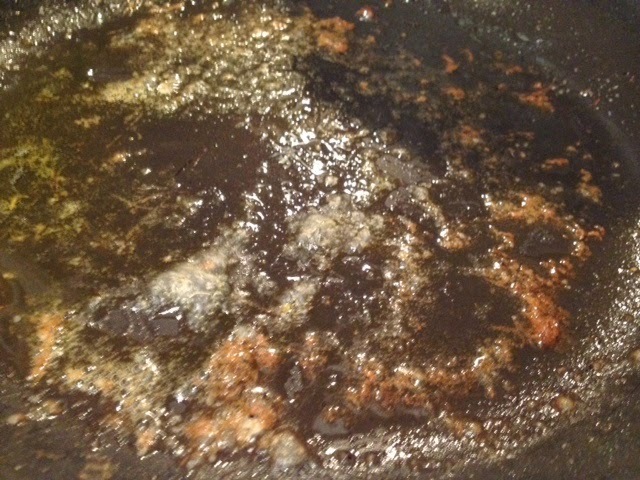 Pour out all of the grease except for about a tablespoon or two. 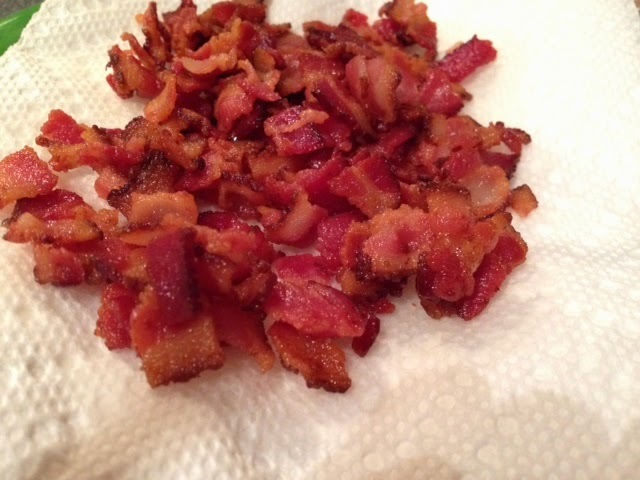 Using a slotted spoon remove bacon from pan and place on a paper towel-lined plate to remove excess fat. Now, let's take care of our shrimp. 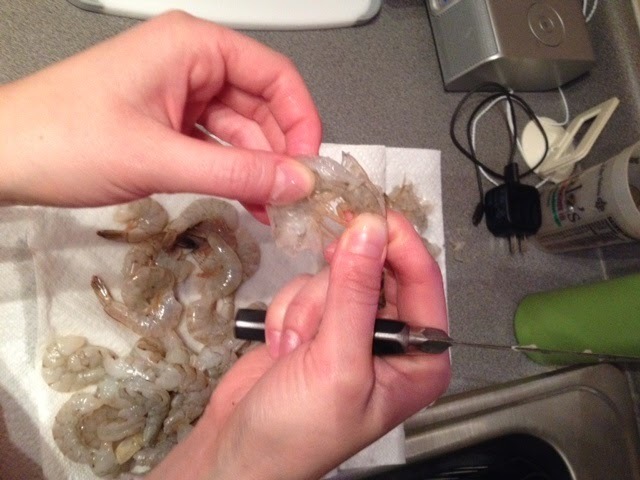 I peeled and deveined it by taking a paring knife and running along that black line on the back of the shrimp. Ever so gently run your knife along it removing that black line as you go-you'll see a black line-see below. 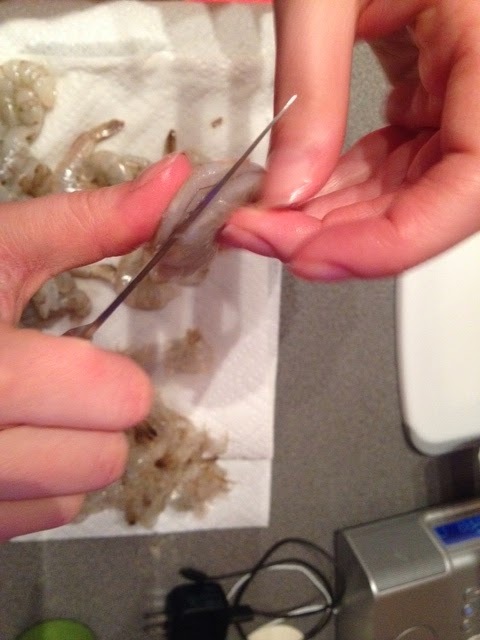 Pull off that tail too, squeezing the end so only the shell comes off. 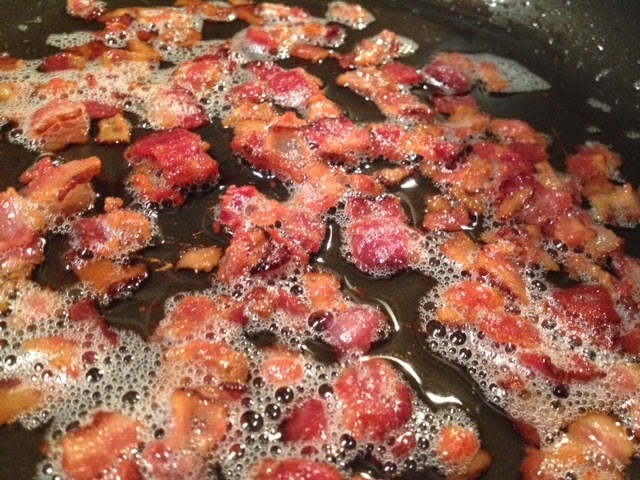 Get the pan screaming hot with that delicious bacon grease and add in about a tablespoon of olive oil. 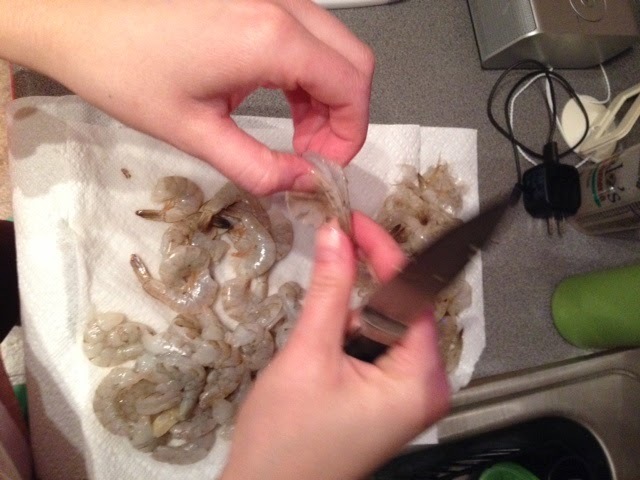 Add the shrimp. After about 40 seconds, flip them and season with salt and pepper. 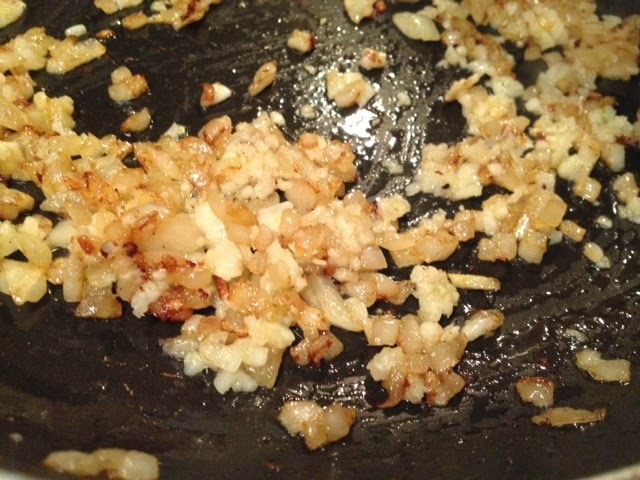 Remove from pan and onto a plate. Leave this olive oil bacony goodness and keep heat to medium high. Throw in your onions. Saute for a minute or two. Then, throw in your garlic. Cook for about a minute. 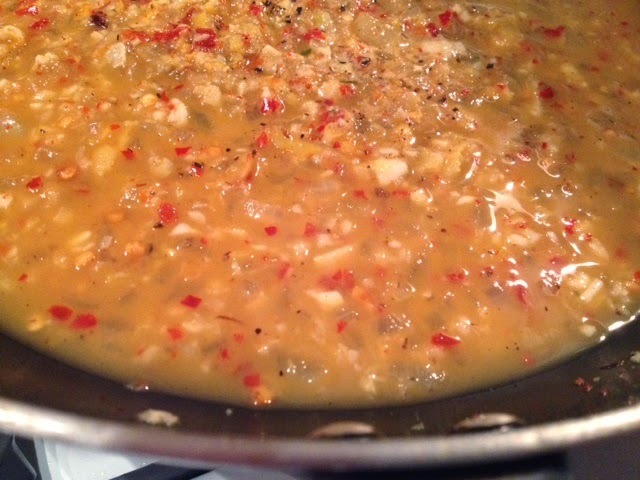 Pour in your wine, chicken broth, and red pepper flakes. 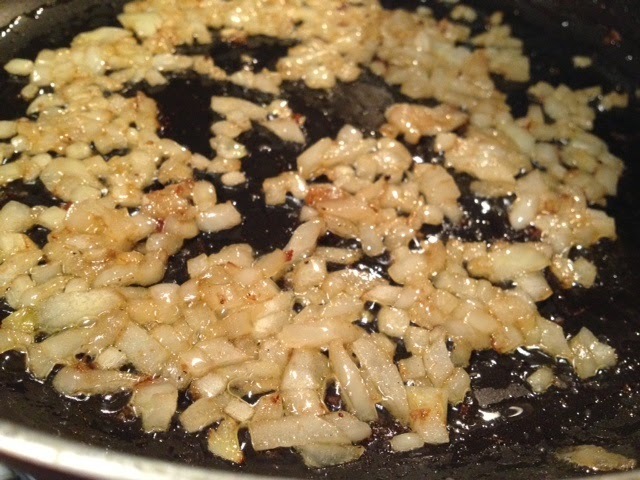 Let simmer for a couple minutes and season with salt and pepper. Cook pasta to al dente. 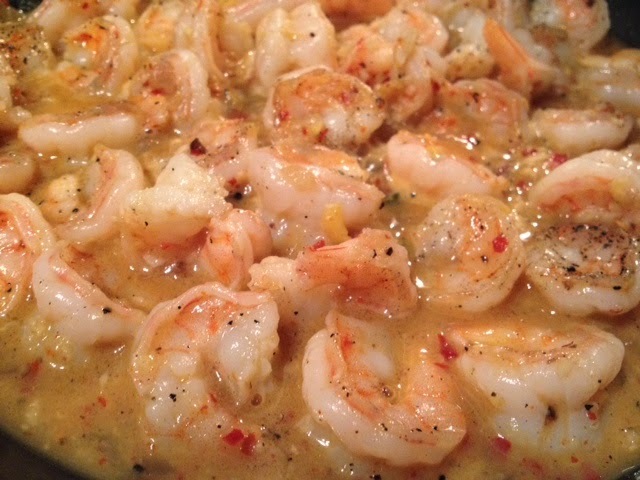 Once sauce has reduced add your shrimp back in. Finish cooking and adjust seasoning. 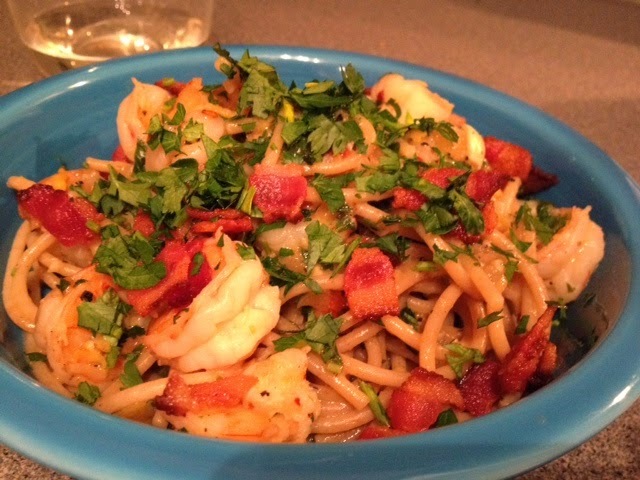 Add pasta to shrimp and stir to combine. Taste and serve! 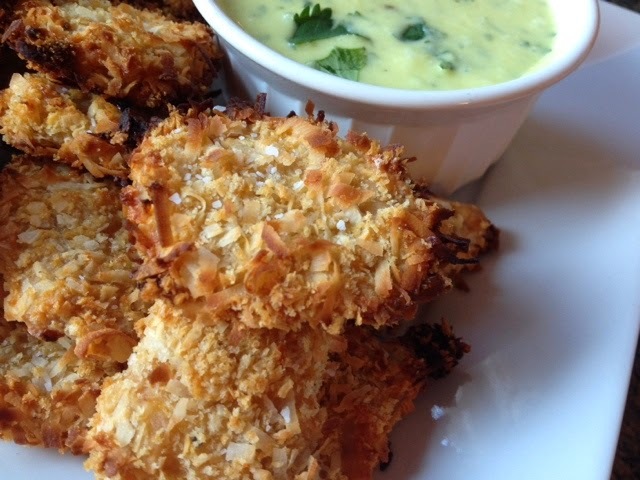 Feel free to serve with parmesan cheese and parsley...add a little butter too, if we're going there! What once was a funny looking plant (ChChChChia) has become a phenomenon in of itself. I have been seeing chia everywhere and in just about everything. I've gotta be honest...it's hard to jump on this band wagon! First off, the look of these seeds are pretty strange looking. If I were to assume, these are what dinosaur eggs would look like, in very miniature size. 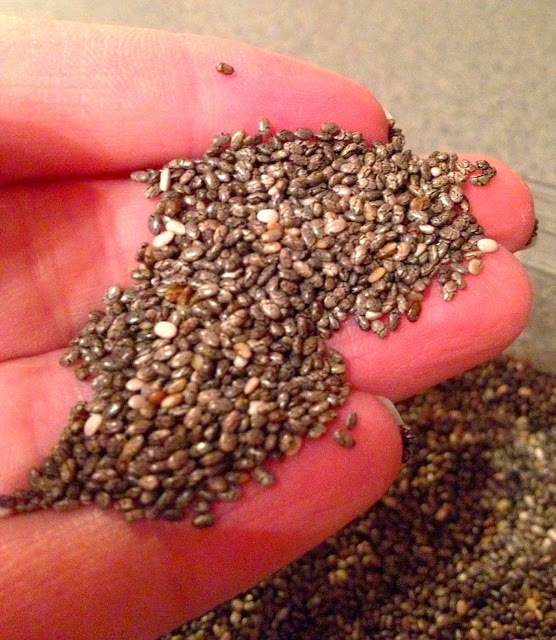 They almost look like poppy seeds, but when you look closer, they are rather unique. 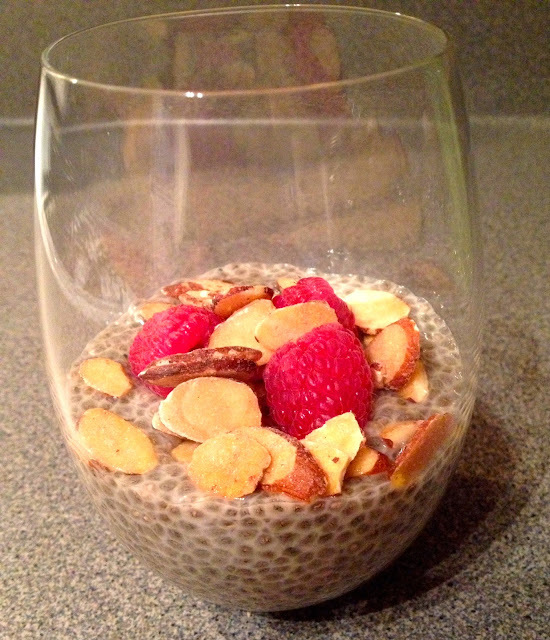 I've tried them in smoothies, chia beverages, and as a yogurt topper and I think chia pudding is by far my favorite (or at least most enjoyable!) I know these little seeds are miracle workers for your health and boasts many positive attributes which is why I am trying so hard to love them. They are rich in omega-3s and are full of fiber and protein along with containing calcium and many more nutrients which I won't pretend to know too much about. The cool thing about these seeds is that they soak up to 12 times their weight in liquid and produce this gel-like coating around them. People compare their texture to that of tapioca, which I would never have known about if it weren't for my dad who happens to love tapioca. 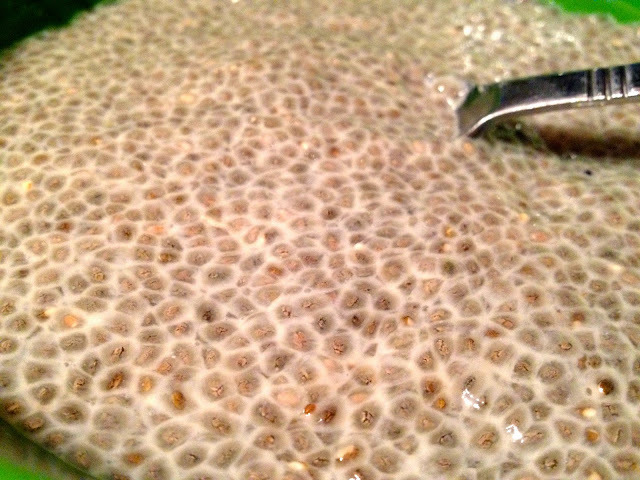 The longer you let chia sit, the more they absorb the liquid you mix it with and after experimenting, I found overnight is best. They absorbed so much liquid that I actually added about 1/4 cup more almond milk in the morning and let it soak in for another 15 min and it was perfect! You could use milk, almond milk, soy milk, coconut milk, etc. Whatever floats your boat! 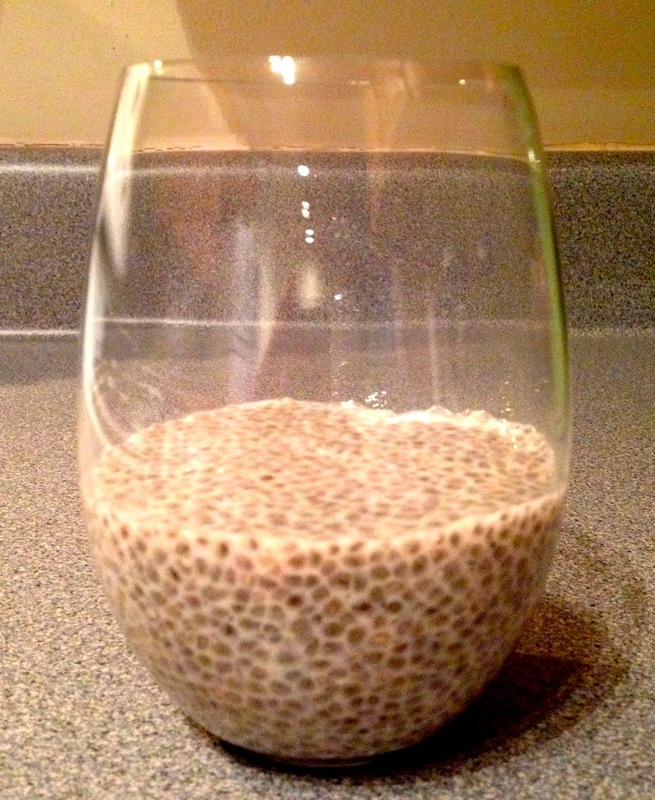 In a medium bowl I combined 3 Tbl of chia seeds with 1/2 C of unsweetened almond milk, 1 tsp of good quality vanilla extract, and 1.5 Tbl of sugar. 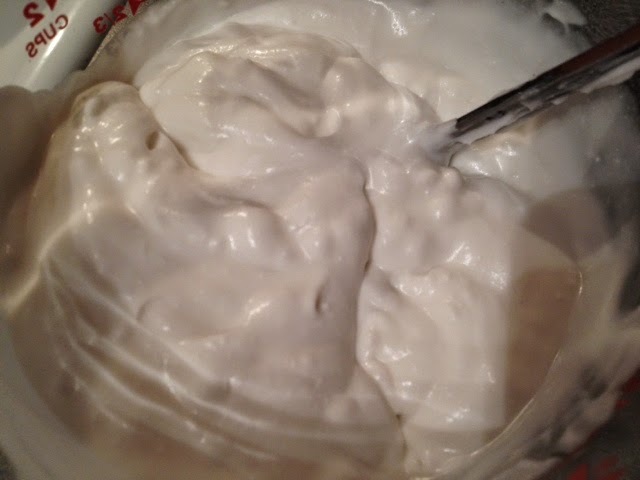 Stir together until sugar dissolves, cover, and place in fridge overnight. In the morning I gave it a good stir, added 1/4 C additional almond milk (it was too thick for my liking) stirred it again, and let it sit while I got my coffee ready. It absorbs pretty quickly! To make it feel fancy I spooned it into a stemless wine glass. And topped it with raspberries and sliced almonds. Adding sweetness with a crunchy texture is just what this pudding needed. 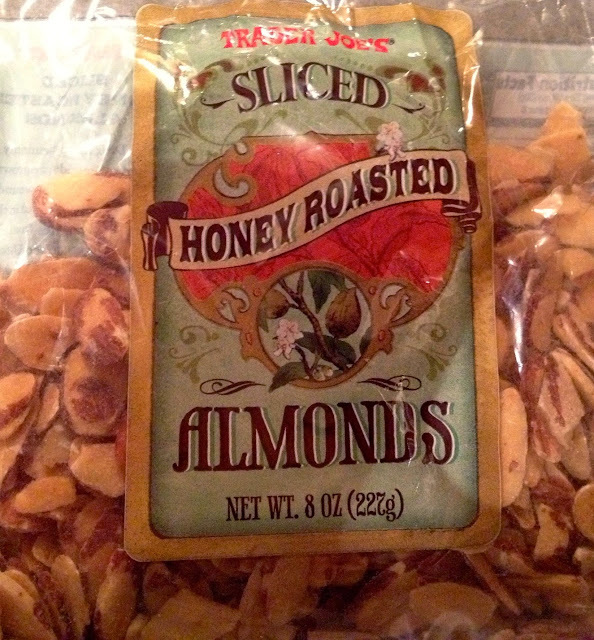 If you haven't tried these almonds from Trader Joe's you must. I've have an abnormal addiction to these lately because they are delicious in just about everything! That's it...very little effort for a super filling and dessert-like breakfast. It definitely has a texture I need to grow used to, but it was pretty darn good! Definitely refreshing on this sunny (20 degree) spring morning. What's your favorite way to eat chia seeds?! 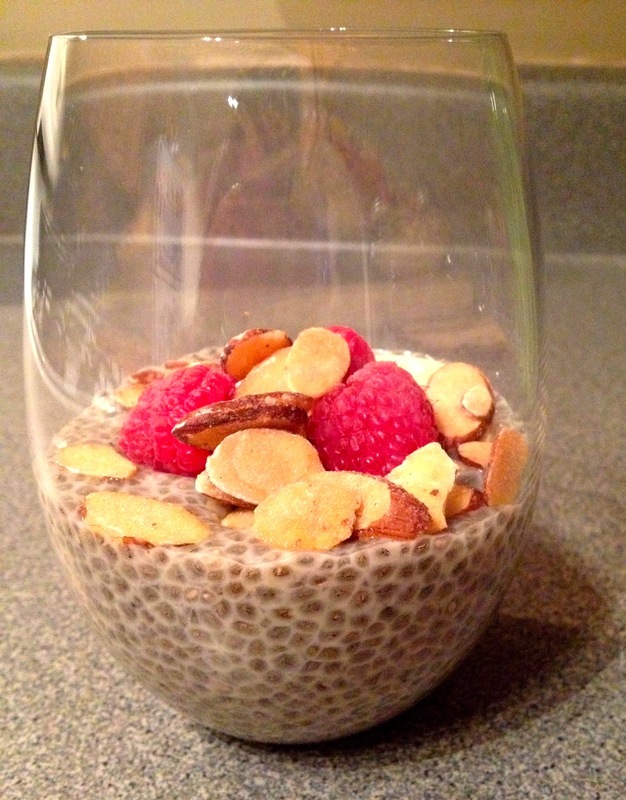 I'd love continue my quest for great chia recipes! It's always tricky getting in a good dinner during the week. As with many of you I commute to and from the city everyday. 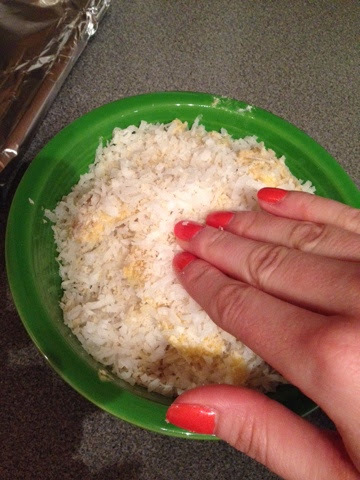 At the end of a long day I want something quick and satisfying with an easy clean up. I often stock up with my favorites and find it a fun "game" to think of something to make utilizing those ingredients. Not exactly Chopped style but you get the idea! I decided on an Asian chicken salad. Tonight's take was purely selected based on what I had on hand and I encourage you to use whatever ingredients you like, using mine as a blank canvas. With that being said, here's what I used tonight. I had baby kale, edamame, shredded carrots, shaved radish, clementines, and avocado. I loved the combo of textures and flavors...kept it interesting with every bite! I diced the chicken for a quicker cook time but also happen to like each piece to be nice and golden brown. I got the pan super hot, added a tiny drizzle of oil, then added the chicken. When it makes that nice sizzle sound, you nailed it! After a few minutes flip the chicken over to cook on the other side. I seasoned it lightly with salt and pepper. While the chicken is cooking combine the dressing ingredients in a bowl and stir well to combine. 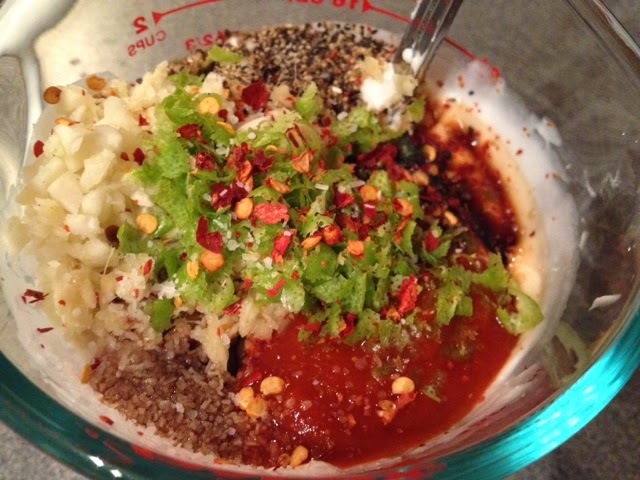 I used fresh ginger, garlic, salt, pepper, red pepper flakes, sriracha, sesame oil, and olive oil. 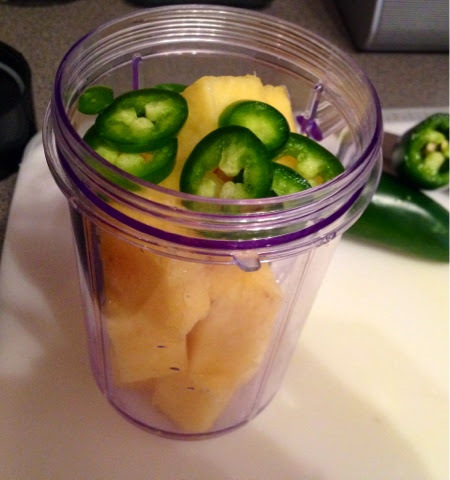 You could certainly do this in a blender or food processor but I was short on time and did it by hand. Now, there are plenty of good dressings out there so feel free to use one from the grocery store but there's something satisfying about making your own! Throw all of your salad fixings in a mixing bowl to fully incorporate the dressing into everything. Kale is one of those vegetables that needs a bit of TLC. Kale is pretty tough and massaging it with dressing helps to tenderize it. It's sort of a high maintenance vegetable...but it's well worth it! Take some tongs and pile it high on your plate (or bowl) and finish it with some sesame seeds. Not a necessity but you eat with your eyes first and it happens to add a nice crunch! That's it. 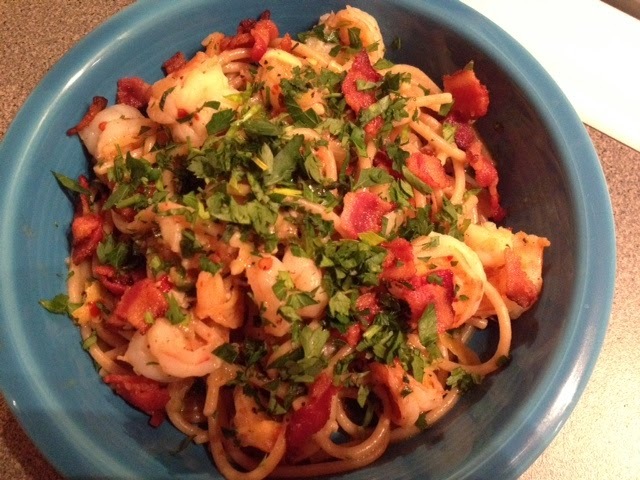 Under 20 minutes and absolutely delicious! What a week! After an unpleasant surprise at work the other day, finding out my car was broken into, I've been busy getting my life back in order. In my car was a large bag full of many personal items including my laptop and jewelry since I was having a sleepover at my parents house. I failed to remember a large pink overnight bag sitting in a car in a quiet parking lot is appealing to some. It's easy to become upset about losing possessions especially some of my favorite pearls!! Needless to say, material items can be replaced. Stress always causes me to indulge in some of my go-to comfort foods and I've been happily obliging...pizza, Portillo's, chocolate...need I say more? Tonight I was ready for a nice home cooked meal. 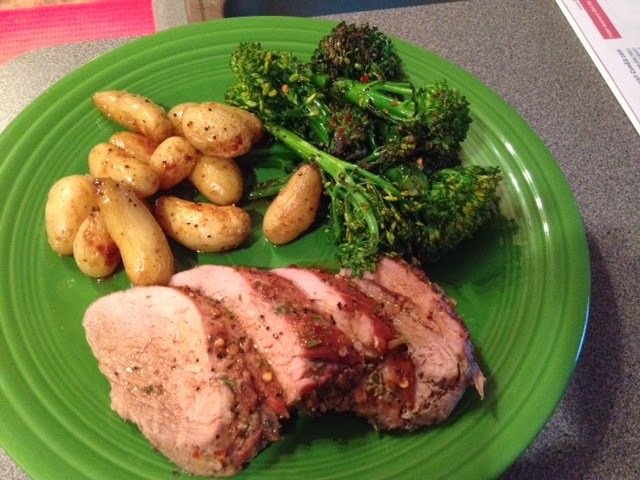 On the menu was an herb roasted pork tenderloin with potatoes and sautéed broccolini. I pulled it together really quickly and in no time you can enjoy this too! I started with the pork marinade. 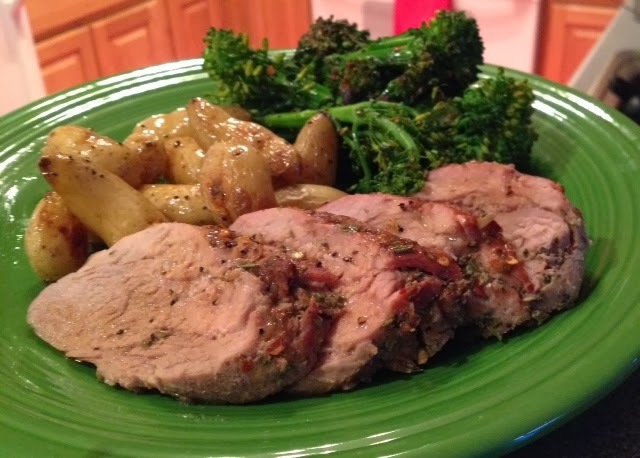 I only marinated the pork for about 15 minutes and it did just the job I was looking for! You can certainly marinate it for a couple of hours if you have the time. I just used some of my favorite flavors I had on hand for this, but feel free to make a personal spin on this! 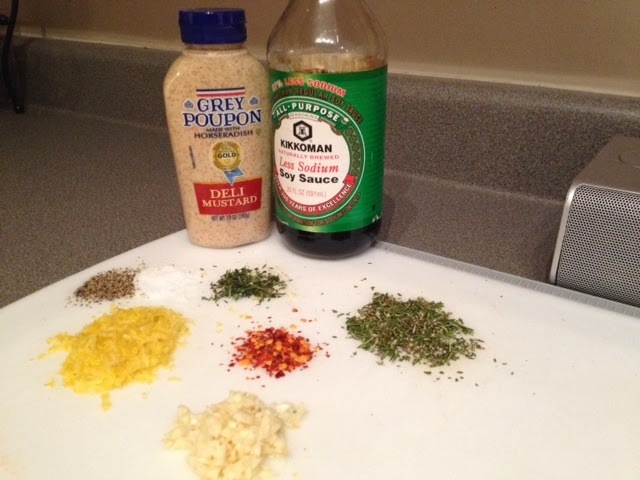 I used fresh rosemary, thyme, lemon zest, garlic, red pepper flakes, salt, pepper, soy sauce, and dijon mustard. I had two small pork tenderloins that were a little under a pound each. 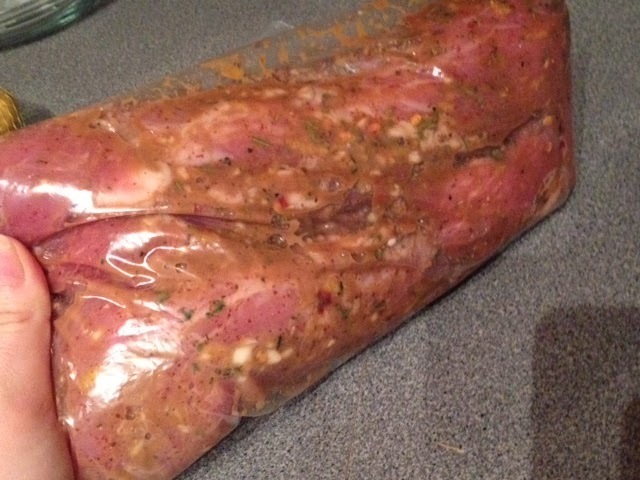 Place them in the bag with the marinade and remove most of the air out of the bag prior to closing. Massage the pork really well to ensure even distribution. 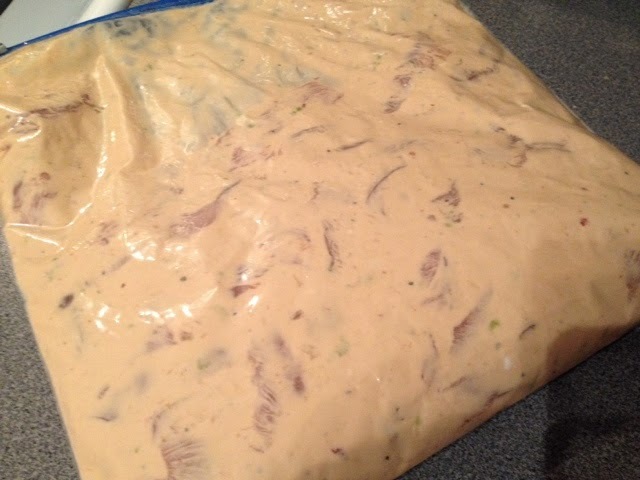 Place in fridge to marinate, or if short on time (like me) just keep it on the counter for a few minutes. While the pork is marinating, get the potatoes ready. 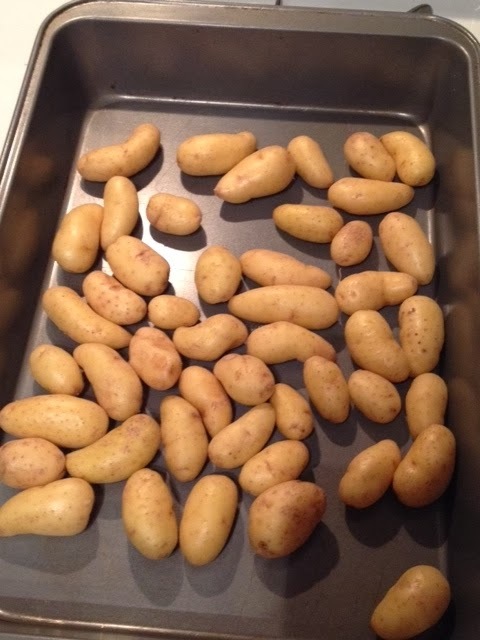 I found these little potatoes at Trader Joe's and thought these would be perfect for roasting. 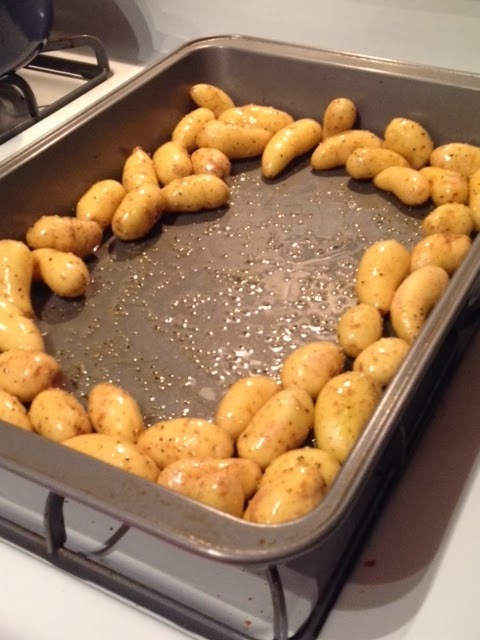 Place them right in a baking dish. Drizzle in some olive oil, salt, and pepper. Toss them with your hands to coat all of the potatoes. 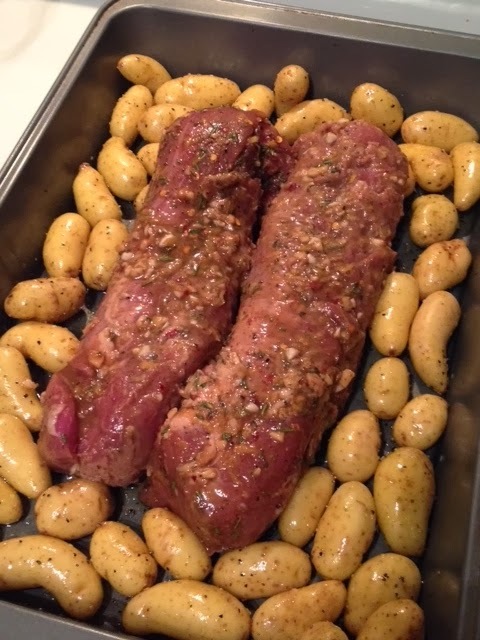 Arrange them around the edges of the dish to make room for the tenderloins. Remove the pork from the marinade and place in the center of the baking dish. If there's extra marinade just pour it over the pork...can't waste that garlic goodness! Pop in a preheated 425 degree oven for 30 minutes or until the pork reaches 145 degrees (if you have a meat thermometer). The pork should spring back easily if pressed. Do not overcook! I repeat, do not overcook! There is nothing worse than dry pork...well...I could probably think of a thing or two. Oh how glorious! Smells of fresh herbs and garlic, what could be better? Remove from the oven and cover with foil to rest. The potatoes were perfectly tender but if they aren't, remove the pork and continue cooking the potatoes until they are fork tender. It is important for the meat to "rest"after cooking to redistribute the juices so when you slice it, it stays inside rather than running all over the cutting board! 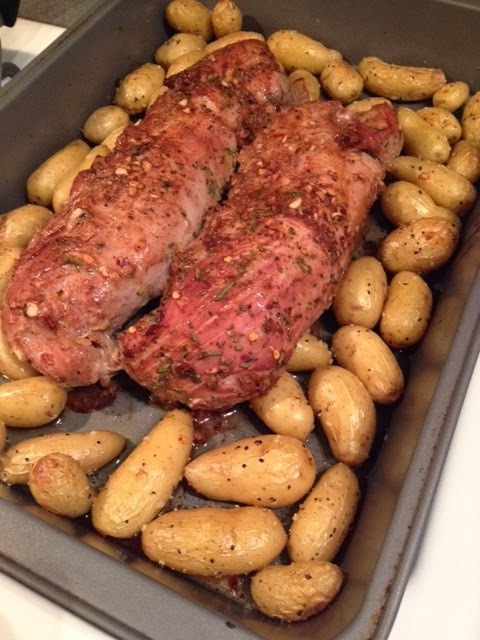 Slice the pork on a slight bias and serve with the potatoes. Pour any juices over the pork for added deliciousness. I also sautéed some broccolini in a little olive oil, salt, and red pepper flakes until tender. 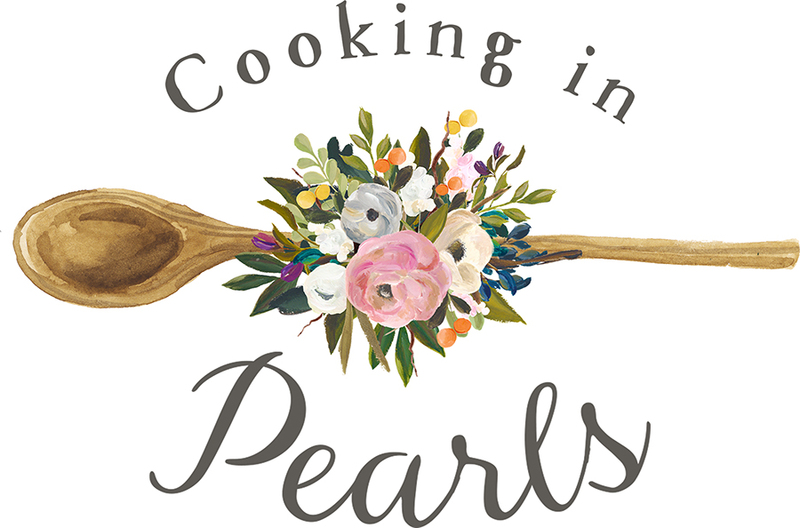 Cooking In Pearls. Powered by Blogger.